– is now live online. This website, along with associated Facebook and Twitter feeds, is being developed by the Department of Arts, Heritage and the Gaeltacht (AHG) in partnership with HistoryIreland magazine and will feature notice of forthcoming commemorative events related to the many significant centenaries to be commemorated in Ireland and the wider world between now and 2022. 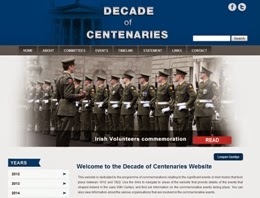 The website features a large volume of unique content including digital versions of past exhibitions – for example the recent Defence Forces exhibition on the Centenary of the Irish Volunteers – as well as material from the HistoryIreland archive that is being made available free of charge online for the first time. Notices of commemorative initiatives brought forward by Government, local authorities, national cultural institutions, colleges, military and local history associations, ex-service organisations and community groups. A record of commemorative events undertaken in the ‘Decade of Centenaries’. A profile of the events that took place in Ireland in 1912-22, in a manner that will provide an impetus for future commemorative events at local and national level. The ethos of the website is inclusive and respectful of different traditions. The broad categories for inclusion are for official commemorations and community events in Ireland and abroad relating to the political, cultural, or socio-economic history of the period between 1912 and 1922.